On a day when browsing through the restaurant menu seems like a task and you are too lazy to place an order, you simply walk into a thali restaurant. For Thaneites the name synonymous with thali for a long time was always TipTop. Well, competition has arrived by the name of Panchvati Gaurav. The brand has its own restaurant chain specializing in Rajasthani food. Located on the 3rd floor of the Koram Mall it is easy to reach. A lunch/dinner here can be clubbed with some shopping over the weekend. 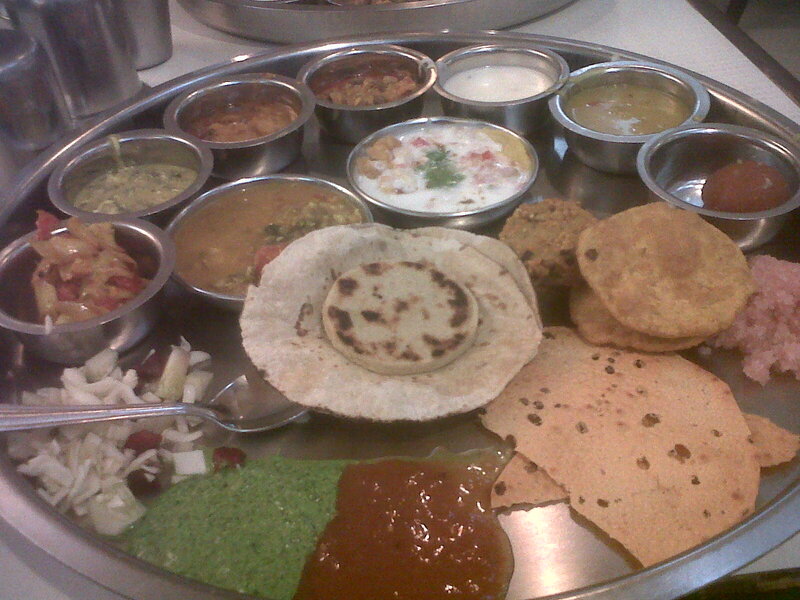 Preferably lunch as this vegetarian thali makes you feel full cause of the variety of dishes. Incase you decide to go in for dinner make sure its an early one. Maharaj ji with the royal moustache greets you at the door. The place is clean and tables well placed. So you have your own food and conversation. Without any delay the serving begins in a predetermined order. Plates, bowls, spoons and food. No nonsense stuff. No questions asked. Not even "normal" water or mineral as each table is already equipped with a mineral water bottle. So you have this in front of you within minutes of being seated. Right in the center is dahi chaat with dal baati next to it. 3 different types of rotis. 5 bowls which include kadi, daal and some common vegetables. Salad, chutney, and papad. Im not stressing too much on any one dish in particular cause it was all so common. Nothing to remember. The sweet dish had the Indian halwa and gulab jamun. I will not rate it highly on the taste meter. Every dish is average. But then its a thali system, so unlimited food is something to smile about. Appreciate the hospitality as the servers take their job very seriously and ensure that you are full and then you eat some more too. All this makes Panchvati Gaurav a nice, neat and clean place to visit when you are in the mood for some simple veg food. I would recommend it just for the fun of trying a variety of vegetarian dishes. Watch out for the quantity thought. You might end up eating more than you would want to. Heavy on the tummy but easy on your pocket. Total value for money with each thali priced at INR 300. So you end up smiling after that happy burp.